When you think of palm trees, tropical locations come to mind, but if you have the time and the patience to care for an areca palm that does not have to be the case. When I was a child we had a greenhouse-style porch that was converted into an indoor area where my mother kept tropical plants. Inside this room there was a collection of beautiful areca palms that she treasured. These plants only grow about eight to ten inches a year, but they can grow to be about six feet in an indoor environment. 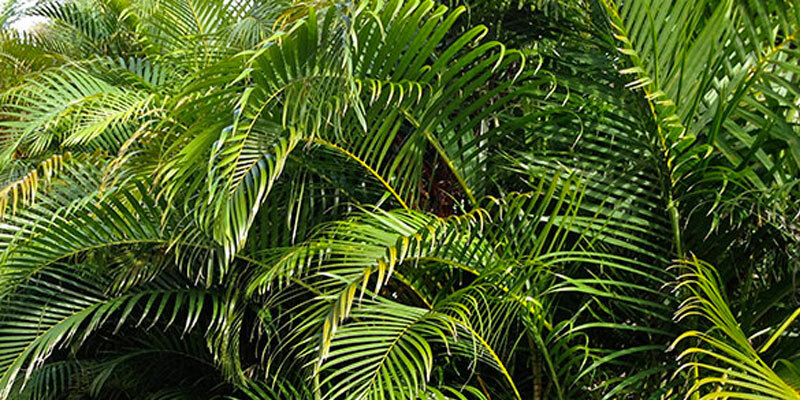 In an outdoor environment, the growth of the palm is not limited, so it can grow up to 30 feet high. The areca palms that my mother cared for were nearly four feet tall, so she had been tending to then for quite some time. When I moved away from home, she gave me one of her beloved palm trees as a housewarming gift, and I soon discovered that the care of this plant was not as easy as I once believed it to be. This guide is designed to share some of the tips that I have learned over the years to help make your areca palms flourish. Areca palms are plants with gorgeous long, feathery fronds that demand a lot of care and attention. Considering that the plant has a ten year lifespan, that is a lot effort to care for a plant, but you will be rewarded with a tropical feel in your living space. Let’s take a look at what the areca palm needs to thrive. Sunlight – These gorgeous plants require a lot of light to grow, but they do not like direct sunlight. If the palm is in an area without enough light, the growth of the plant will slow considerably. If it is receiving too much direct sun, the leaves will begin to turn yellow from sunburn. Water – Areca palms seem to have an unquenchable thirst during the spring and summer months. Ensure that the plant is in a well draining pot because sitting in water will cause the roots to rot. If you overwater the palm and there is no place for the water to drain, it is likely that the plant will die. In fact, this is the most common reason that a areca palm dies. Also, this plant does not like water that has chemicals in it. Salt, chlorine, fluoride, and other chemicals that can be found in our drinking water will cause dots to form on the leaves, so use distilled water whenever possible. Temperature – These tropical beauties prefer warm temperatures that are between 65 and 75 degrees Fahrenheit. It will not tolerate temperatures that drop below 55 degrees Fahrenheit, and cold drafts of wind can cause the leaves to form brown spots. High humidity is also recommended to keep the leaf tips from turning brown. Soil – This plant prefers soil that is rich in nutrients as well as a bit on the acidic side. I like to use a peat moss, sand, and bark mixture that is heavily aerated and drains well. Fertilizer – Every spring you should feed your areca palm a time release fertilizer pellet. This will ensure that it is receiving the proper nutrients that it needs to grow during the spring and summer months of the year. You should also give the plant a liquid fertilizer once a month during the growing season. The fronds of the palm will benefit from a micronutrient spray, so use a diluted mixture that you can spritz directly on the leaves. Do not fertilize the plant during the winter. It will not need the extra nutrients when it is not growing, so the salt that is present in the fertilizer will simply sit in the soil. When you grow an areca palm indoors, you will want to keep it in a large pot, but not too large, as the palm does like to be slightly root bound. This will also keep the palm from growing too tall Inside your home. Repotting is only required once every two to three years, so as long as the palm is healthy, there is no need to transplant it more frequently. The areca palm will create new growths from the center of the plant, which means that pruning or trimming the palm down will harm the new fronds. If the tips of the leaves become brown and unsightly, they can be trimmed, but new growths should never be trimmed because that can stunt the growth of the plant. Spider mites tend to be an issue with Areca palm plants; they enjoy eating the dust that accumulates on the fronds of the plant when the humidity level is low. To get rid of this issue, you simply need to wash down the fronds with soapy water to remove the pests. Mealybugs also tend to be an issue that can easily be washed away. When it comes to health issues, the main ailment of the areca palm is root rot, which comes from over watering the plant. Pink rot can also result from excess water, so make sure not to overwater your palms. Brown leaves are often a sign of too much fertilizer or a lack of water. Yellow spots on the leaves indicate that the acidity in the soil is too high, or the potassium levels are too low. 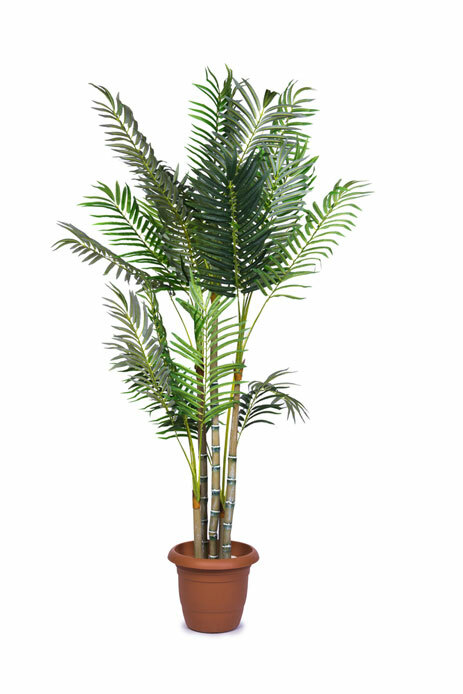 The areca palm is extremely effective at cleaning the air that is in your home. According to Doctor Wolverton’s research in the NASA Clean Air Study, the areca palm has the eighth best formaldehyde removal rate for plants. In addition, it can also serve as a humidifier. It can produce up to a litter of water every 24 hours, which is perfect if you have asthma, allergies, or other breathing complications. The areca palm is a unique plant that requires a lot of care, but now that you know what is required, you can purchase one and make the tropics part of your home décor.